So cold, so much snow, can’t get Key West off my mind. I must, but before I do, one final post and a cocktail, the Key Lime Martini (shot with my iPhone in a dark bar). Donna and Abby (of Spaceman Spiff) once tried to recreate this but couldn’t get it right; we all got too drunk trying and had to give up. I thought it impossible to make outside Key West, but one of the boys, Jason, said he makes these for himself and his wife Kristi every weekend. His recipe is below. Or you can watch below as the wonderful Ramsey pours one at the White Tarpon, a beloved watering hole in Key West, if you don’t mind the poor lighting. The sweet and sour mix Ramsey uses is Daily’s, Jason tells me. Jason uses Mr. T’s. I know, I know. There’s also that Rose’s lime juice in there as well. But it is what it is. For a homemade sweet and sour mix, combine lemon and lime juice with an equal part of sugar. That said, the drink only tastes the same with the pre-made stuff. I love to make potato chips. But I also love Pringles. So shoot me. OK, time to get back to winter, but will be having one last one of these at the end of the day, dreaming of Key West, a year away. In a ziplock bag crush the graham crackers with the sugar and shake it up. Then place the crushed graham cracker–sugar mixture on a plate. Dip the rim of the martini glass into water, then dip it into the graham cracker sugar mixture. Add the fluids to a cocktail shaker filled with ice and shake 10 to 15 times. Strain into the chilled glasses. Key Lime Martini from Michael Ruhlman on Vimeo. My recent posts on the Key West Reflections, Importance of Family Meal, and The Key Sunrise. Learn how to make your own sour mix. 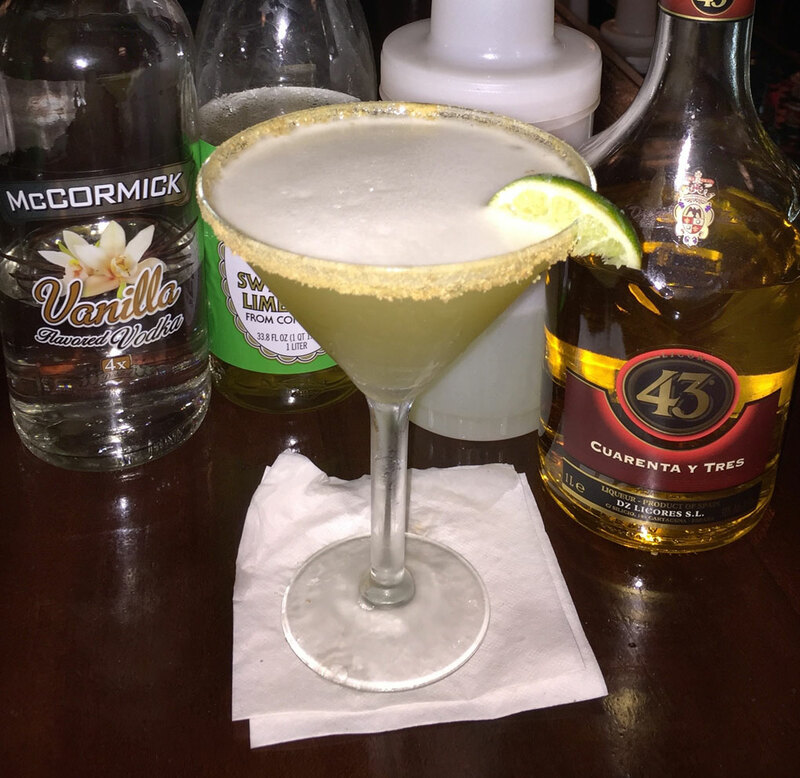 Licor 43 is a Spanish vanilla-citrus liqueur; here are a few more recipes using this unique product. My favorite bar in Cleveland is the Velvet Tango Room. Jesus Christ NO!!! Crush graham crackers? I know they are optional but still. Carole, that’s kind of harsh, don’t you think? Unless you’re my mom in which case, of course you’re right and what was I thinking. You talk about ‘pre-made’ stuff as if it was worse than … worse than … er … something really bad. Of course the pre-made stuff is the defining taste; many drinks were developed by the big marketing firms to sell the stuff. You might as well deny the appeal of McDonalds’ fries, or Hostess Twinkies, or Cheez-Doodles, or Pop-Tarts; there’s a time and place for all of these things. A former friend of mine would give you a lecture for calling it a ‘martini’. But semantics aside…and the fact I’d use fresh lime juice…this sounds delicious. Would it be a faux pas to use bottled key lime juice? Right on Michael, reading your post last week about the regatta I was thinking about Key West and wondering if the White Tarpon was still there. Their martini is the best and I got the recipe from them a few years ago when we had a Key West West party for the crew here in LA. They don’t taste quite the same as they do sitting in that great little bar though. i am with Judy above, i wouldn’t call it a “martini”, but it doesn’t mean i wouldn’t make one and drink it. I thought the same thing. Then again, I have had traditional martinis made with gin, vermouth and an olive that should not have been called a martini either.